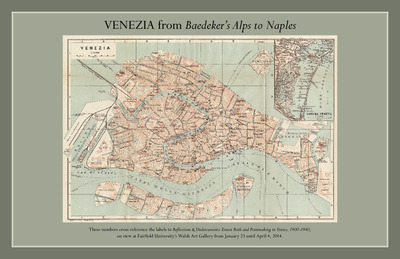 In the Wake of the Butterfly: James McNeill Whistler and His Circle in Venice - "Venezia"
"Venezia," from Karl Baedeker, Italy: From the Alps to Naples (Leipzig: Karl Baedeker, 1909), with additions by Eric Denker. 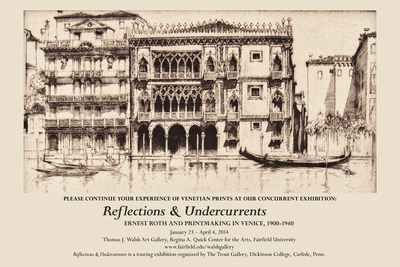 Reprinted for the Reflections & Undercurrents: Ernest Roth and Printmaking in Venice, 1900 - 1940 exhibition at the Thomas J. Walsh Art Gallery, January 23 - April 4, 2014. 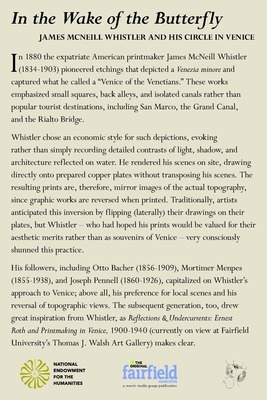 Didactic panel for In the Wake of the Butterfly: James McNeill Whistler and His Circle in Venice at the Bellarmine Museum of Art, January 23 - April 4, 2014. 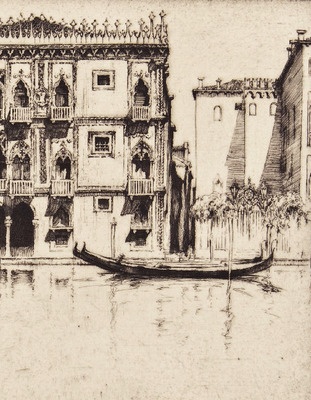 Catalogue for In the Wake of the Butterfly: James McNeill Whistler and His Circle in Venice at the Bellarmine Museum of Art, January 23 - April 4, 2014. 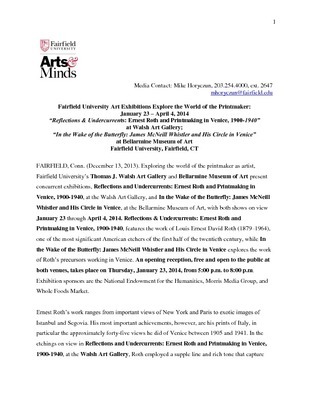 Opening reception invitation for In the Wake of the Butterfly: James McNeill Whistler and His Circle in Venice at the Bellarmine Museum of Art, January 23 - April 4, 2014. 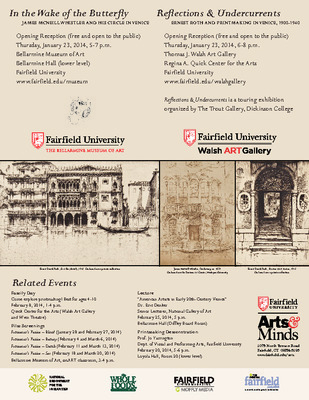 Banner for In the Wake of the Butterfly: James McNeill Whistler and His Circle in Venice at the Bellarmine Museum of Art, January 23 - April 4, 2014.